PHILIPSBURG – “It’s been really rough,” says teacher Colleen Cato with tears in her eyes as she leads Cyriel Pfennings-Richardson and John Sandiford through the daycare center where she had been working for 27 years prior to hurricane Irma. All 34 daycare facilities that cater to kids from 0-4 years old on Sint Maarten were affected by the hurricane. Seven, including Colleen’s school, were completely devastated – losing their roof, furniture and most of their educational-material. This also means that Colleen and her co-workers are out of a job. Cyriel and John, are founders of a foundation called Rebuild SXM. 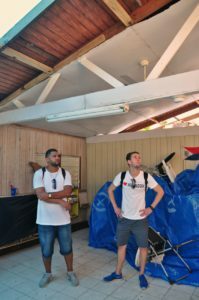 Their ambitious initiative aims to raise $100.000 to help Sint Maarten rebuild. Having met their first milestone they decided to contact various schools and deliver a variety of requested materials to Sint Maarten. Six months later, Colleen is finally hopeful that she will receive some of the insurance payout to fix the roof of the daycare. However, as in most cases, furniture and school-material is not covered by the schools insurance. As Cyriel and John look around the remains of the daycare center, you can see that the duo is shocked. They have two boxes full of materials in hand to donate to Colleen. However, it is clear to them that this is just fraction of what the daycare needs to reopen their doors. “This visit in particular was very emotional. We hope to provide a platform for this school and others in need to help them acquire more materials,” explains Cyriel. Of the daycares that suffered major damage some, like Colleen, are hoping to rebuild, others have been forced to close their doors for good. Daycares do not fall under government, which means that they are not covered under government insurance. Khalila Aventurin and Sophia Farrell-Hassell, representatives of Early Childhood Development Association (SECDA), do hope that the government realizes the need for support: “None of the daycares have received any financial government support,” they state. Similar sentiments are shared with various day-care owners. “Even if government could just support the tuition of some kids, that would help,” says Diandra Pikeur, owner of Busy Body playschool. “The island still needs a lot of help, but it’s of utmost importance that donations are tailored to what is really needed,” says Cyriel.